When you hear a good story, you listen. The same elements of powerful storytelling that captivate us in our everyday lives benefit businesses and their brands. 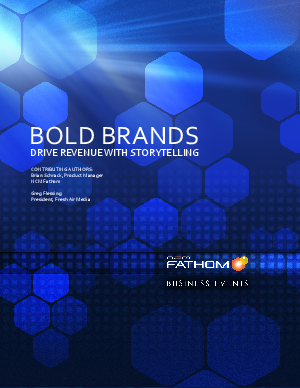 In this white paper, NCM Fathom explores how business stories engage audiences, build loyalty and drive bottom line results. Learn how bold business brands like Kleenex and Siemens have shared their brand's story with clients, customers, employees and other key players using the optimum environment for storytelling, the cinema. These stories take a variety of forms, from mini-documentaries and dramatizations to variety shows and can be told live or pre-recorded to cinemas across the country. Storytelling is an effective tool for business in that it compels audiences to feel, change and take action. The combination of a good story and the powerful cinema setting is proven to encourage higher attendance, command better audience attention, and in turn, increase message retention. The bottom line? Storytelling delivers results and today's businesses are looking for just that.